This is a prime example of why you shouldn’t automatically spray a pesticide when you see chewed leaves. Because while there’s no denying that these leaves have been chewed, in this case, the remedy calls for a repellent, not an insecticide. The hosta has provided a tasty snack for the resident groundhog (or woodchuck, depending on your regional preference–it’s still the same animal) family. These creatures are one of the most notoriously difficult garden pests. They tunnel, they climb and they have voracious appetites for greenery. And once a woodchuck has established a liking for your property, he will return year after year to mate and raise a family, ensuring repeated destruction. The only proven method of control is fencing that not only extends four feet in height, but also goes at least a foot underground–and this proves impractical for most folks. Some call in a licensed wildlife person to relocate the animal. In some states, it is legal to shoot them–it is not legal to do so in my state (much to the chagrin of some gardeners, I know.) I have gotten extremely lucky by planting herbs around the perimeter of the vegetable garden and only putting in peppers and tomatoes. He (or she) has sampled a pepper, found it not to his liking and has left the rest of the garden in peace for two years in a row. I can’t promise this approach will work for everyone. Repellents to try would be the same ones that would work for deer and rabbits (but do not try them on edibles unless the label specifically says that they are approved for use on edibles!) and would be those that contain hot pepper, perhaps mixed with rotten egg. Previous Article What’s Eating My…. Two friends of mine are having problems with groundhogs this year in their ornamental gardens. One hired an outside trapper that was not successful. My other friends trap their own and release with marginal success. I’m dealing with deer browsing. Deer are not usually a problem for me-I get a stray one once in a while. A little spray and that’s the end. Not this year. Despite sprays and sprinkles, the doe with the cutest little spotted fawn is prooving to be a formidable foe. Damn hooved minions of Satan :). I’d laugh if I weren’t right there with you! Did you ever wonder why they have cloven hoofs? Over the weekend the deer browsed the grafted tomatoes I’m testing (so much for that edge! ), all my lettuce, and all my pole beans. Guess they felt like a little salad! Meanwhile the hosta and the daylilies are fine. Go figure! I replanted the beans and I’m trying to surround the garden with string and CDs–the Spoiler thinks it’s the ugliest thing he’s ever seen. I’ve told him to think of it as kinetic sculpture but he’s not buying it. All I care about is that it keeps the deer away. We’ll see. 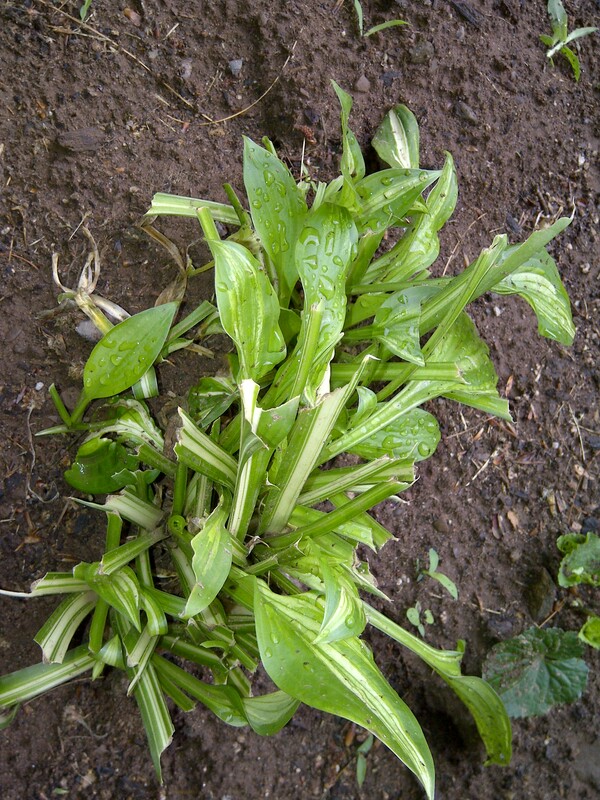 Your poor Hosta! I’m glad we don’t have Groundhogs in Ireland. The slugs are enough to contend with.